Liquid Levitation Sculptures are liquid sculptures that float freely. This is possibly through controlled magnetic fields that are calculated by a micro-controller. The sculptures differ individually, but are similar in size and basic shape. The density of the fluid is comparable to that of motor oil. A sculpture is approx. 9 cm in height and has a diameter of approx. 4,5 cm. 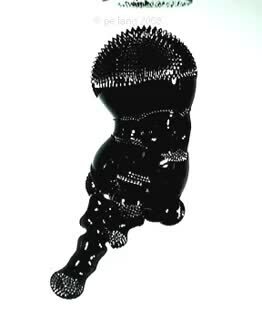 The weight varies from 80 - 100 g.
The sculpture is composed of magnetic spheres of various sizes that are encompassed by ferrofluid. The sculpture is kept in the air via an electronically regulated electromagnet (see above picture). This work by pe lang was exhibited at the Swiss Art Awards in Basel (2007). The copyright for all pictures and the video on this page remains with the artist.